Flute bodies, footjoints, and headjoints are all kept in order on stands with multiple pegs. In this photo, the stand toward the back contains flutes in for an overhaul, and the stand in the front has flutes in for a COA. Each individual flute takes up three pegs (one for the footjoint, one for the body, and one for the headjoint). Each flute will also have a tray for the mechanism -- as you can see in the bottom right-hand corner of the photo below. These trays have divided compartments so that the mechanism components can be easily organized. Each tray has a piece of masking tape at the end marking the serial number of the corresponding flute. Mechanism steels are small and could potentially be very easy to loose if they are not well organized. Rachel has acrylic blocks that were made in the shop here at Powell. 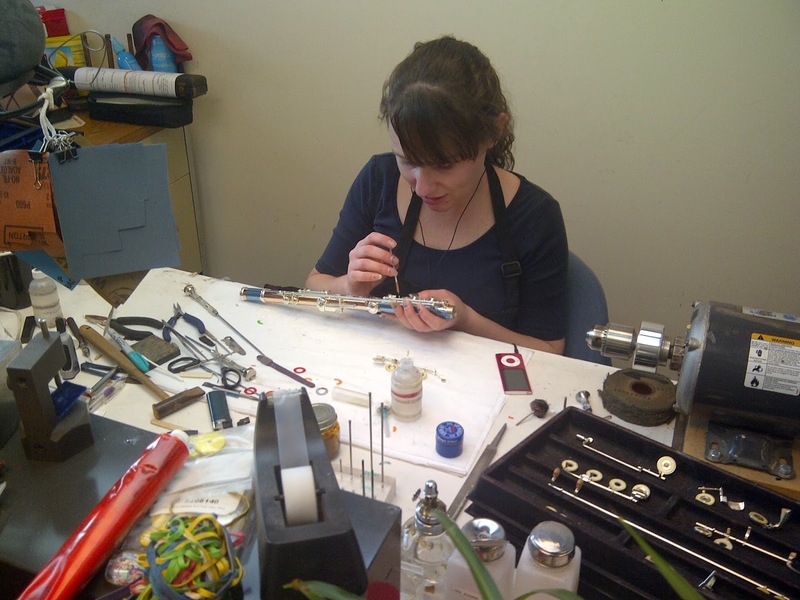 The blocks have small holes drilled into them, and Rachel organizes each flute's set of steels, marking areas on the block with the flute's serial number. Not every repair technician will have the same set-up for tools, but Rachel's looked very unique (as you will see in the photo below). She told us that she built this tool holder with her father -- and the frame is actually mahogany! The tools are held onto the top horizontal block with magnetic strips. The secret behind this block is that it is actually a knife holder from IKEA. Looks like Rachel has a very practical and personalized way of keeping her tools organized! Finally, we asked Rachel how she keeps track of the "diagnosis" is for each flute. She told us that each flute has its own repair paperwork -- a form indicating everything that needs to be done. Once the flute is completed, the customer receives paperwork with a complete break-down of the repair work completed on the flute. To schedule your repair online, visit https://powellflutes.com/repair-doctor/schedule?destination=repair-doctor/schedule/repair. I keep forgetting that there are actual people involved in the making of instruments. That always makes me wonder how many hours they had to spend learning how to repair the instruments and all the small details. It's just amazing to me and they definitely have my respect. Thank you, Seamus! It definitely takes a lot of hard work, training, and patience to repair and build the instruments. It truly is amazing to see all the hand-craftsmanship in the process of building and repairing these instruments.